Check your Midnight Express stereotypes at the door - this is a rapidly modernising country with one foot in Europe and one in the Middle East. It's not all oriental splendour, mystery, intrigue and whirling dervishes but it is a spicy maelstrom of history knocking up against a pacy present. The Turkish people have an unrivalled reputation for hospitality, the cuisine is to die for, the coastline is a dream, and many Turkish cities are dotted with spectacular mosques and castles. And while costs are rising, Turkey remains one of the Mediterranean's bargain-basement destinations. Turkey - and no not the Bird! Photos: Dernier pays de notre tour du monde: la Turquie! 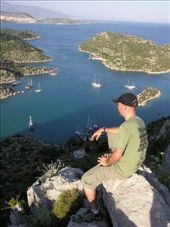 My favourite shot from Turkey and it was walk the tough climb up. Overlooking 'Pirates Cove' - named for the tourists.